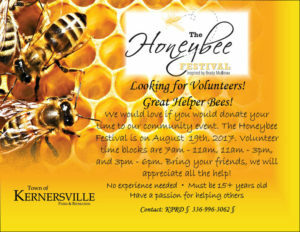 The Honeybee Festival is a large part of Kernersville history, and we would love your help to make it a memorable day! Volunteers are a big help for our special events. We have time slots available from 7am – 11am, 11am – 3pm, & 3pm – 6pm. Volunteers will be responsible for assisting vendors unload/load, take tickets at games, supervising inflatables and games, and clean up. We are looking to have at least 10 volunteers per shift. Be a part of the Honeybee Festival! For more information about what will be at The Honeybee Festival visit http://kvhoneybee.com/; to volunteer give us a call 336-996-3062×3.